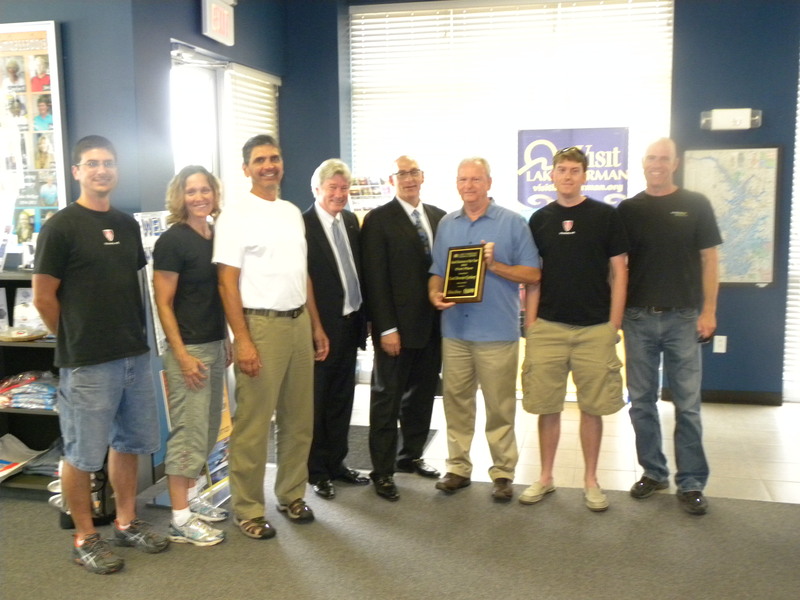 The Lake Norman Chamber of Commerce has selected Mooresville’s Cool Breeze Cyclery as the 2012 Small Business of the Year. Chamber Chairman of the Board Jack Salzman presented the award to owners Steve Doolittle and Chris Vasiloff at a reception held at the Chamber Thursday, May 24th. The business carries Trek, Gary Fisher Signature, and Cervelo bikes with 12 full time employees. They have two locations in Mooresville and Charlotte. Salzman announced that a committee comprised of himself, Hilary Broadway – Chamber Chairman for Business Growth, and Denis Bilodeau – Chairman of Community Affairs, selected the recipients from nominations received from the membership. Criteria including growth in revenues, staying power, innovative marketing and management practices, growth in employees, business friendly nature of the business, and involvement in the community. The Cool Breeze Cyclery opened a new location six years ago in Charlotte after operating more than a decade in downtown Mooresville. The company created its own signature “Lake Norman Excursion” charity ride for the American Red Cross. Attendance has grown to nearly 1,000 riders in its sixth year and the combined charitable contribution to the Red Cross exceeds $80,000. 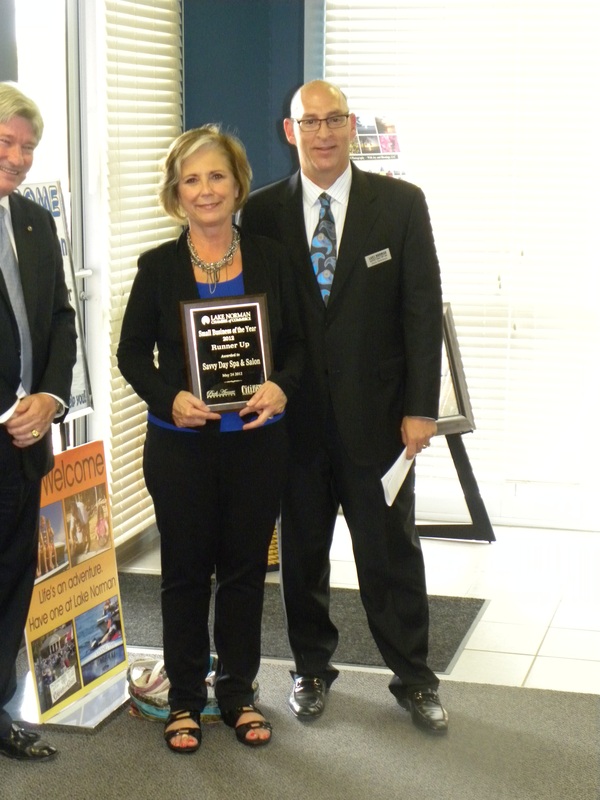 The Chamber also recognized Pat Helmandollar of Savvy Salon and Day Spa in Cornelius as the runner up. Salzman cited that the business has anchored its shopping center creating a center of business vitality and undergoing a recent remodeling. In 2011, Savvy Salon saw a 44% increase in gift certificates with 40 employees involved in the business. Helmandollar spoke about their community focus, Make A Wish, as a priority fundraiser. In addition to the winner and runner up, the Chamber also recognized The Welcome Committee, Inc. in Mooresville and Uncommon Scents, Inc. in Huntersville as two outstanding small businesses who were cited as Honorable Mentions. “The Honorable Mentions were themselves outstanding businesses. Each of these nominations demonstrated a growth in revenue; had marketing or management practices that made them stand out, and each gave back to the community,” stated Salzman. The reception wrapped a week-long series of events which included seminars conducted by the Small Business Administration and SCORE as well as business and sales coaches on networking and marketing a business on the Internet. The three Towns of Cornelius, Davidson, and Huntersville each proclaimed May 21-25 Small Business Week in partnership with the Chamber and the Small Business Administration. For more information on the Lake Norman Chamber of Commerce, visit their website at http://www.lakenormanchamber.org.org or call 704-892-1922.